Michelle Lujan Grisham was elected Governor of New Mexico in 2018. She was previously a U.S. Congresswoman for New Mexico’s 1st Congressional District, a position that she was first elected to in 2012. She urged former Interior Secretary Ryan Zinke to leave New Mexico’s national monuments alone, supported reauthorization of the Land and Water Conservation Fund, and opposed selling off public lands. Lujan Grisham has also supported sage grouse habitat preservation and curbing methane emissions. Then-Representative Michelle Lujan Grisham Urged Former Interior Department Secretary Ryan Zinke to Respect the Wishes of New Mexicans and Leave National Monuments Intact. 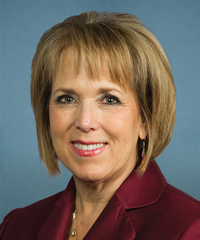 Then-Representative Michelle Lujan Grisham Supported Reauthorization of the Land and Water Conservation Fund (LWCF). Then-Representative Michelle Lujan Grisham Voted to Preserve Sage Grouse Habitat. Then-Representative Michelle Lujan Grisham Applauded Methane Standards. Since 2017, Michelle Lujan Grisham has taken at least $11,000 from Chama Trout Stalker LLC. Michelle Lujan Grisham took $5500 from Chama Trout Stalker LLC in January 2017.